SimulIDE_0.3.10-SR1 executables are ready for download. This is 0.3.10 with a few bug fixes but same functionality. 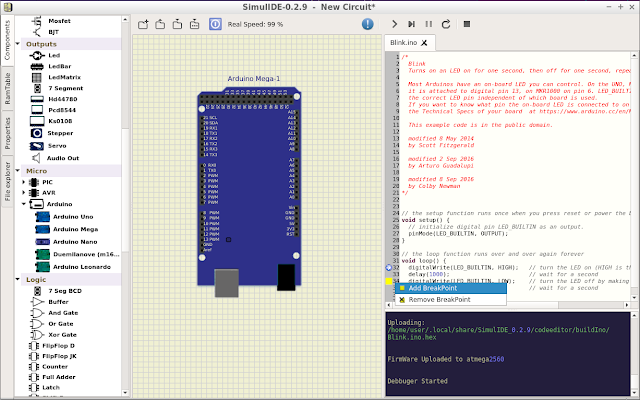 SimulIDE_0.3.10 released with a bunch of bug fixes and new components and features. - Pic open collector pins. - Circuit properties save to simu file. - Text Component: Font property. - Seven Segment: configurable led properties. - Seven Segment: vertical pins. - Mux and Demux shape. - Led Brightness more realistic. - Animate wires (Logic States). - Text size in svg. - Editor: enter key, crash first time. - Some components mouse interaction. - Pic serial monitor missing characters. - Pic simulation not restarting in some cases. - Pic wdt not clean at start. - Buses not working for sizes != 8 bit. - Fix Gates oscillating in some cases. - Crash on missing package files in some cases. - Redraw Issues (Text and Gates). - Subcircuit: not connected pin issue. - Component names not correctly translated. - Pic Serial, error sending several characters at once. - Led bright update at low circuit speeds. - Midbutton Circuit panning not working properly. I created a new SimulIDE's Patreon page for people interested in supporting this project. - Get info about development state. - Vote on feature request priority. - Vote on projetc's future decisions. - Access to early builds with bug fixes. - Request videos, tutorials, etc. The goal with this page is to be able to work full time in SimulIDE and accelerate the development proccess. It was a very nasty bug making Arduino compiler crash in Windows systems in version 0.2.9. This one solve this issue along with other minor issues. - I²C to Parallel module. - Save State of Plotter and Serial widgets in circuit file. - Save State of Wavegen and Clock Components. - Power pins in OpAmp. - Russian and Spanish translations. - Makefile and xml highlighting. - Debugger can drive circuit or not. - Arduino Debugger: Better variable detection. - Speed up big circuit loading. - Speed up asm files loading.